During the night the rock and roll of the ship had increased somewhat. I had my Sea Bands on again. 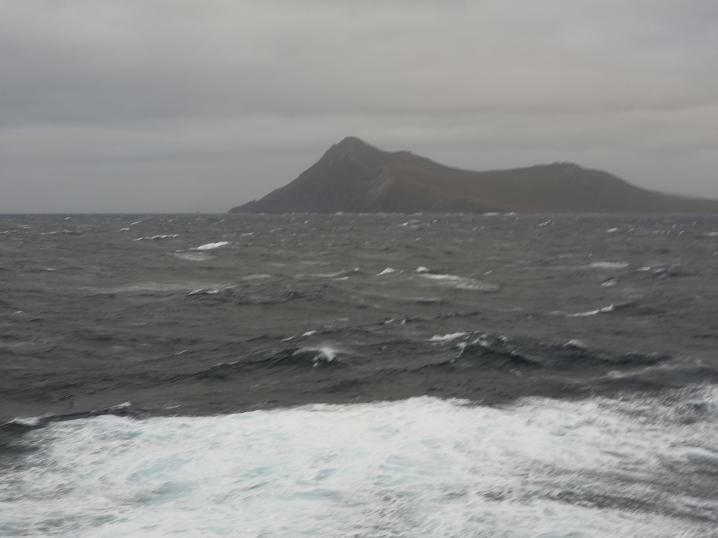 We were due at the cape between 8 and 8.45am and were both up before that to see the approach. Unfortunately the sea was very rough and I got a video of our our approach and a couple of photos before I had to sit down and do a bit of deep breathing with sick bag at the ready. This was obviously the source of entertainment for some who sat staring at me waiting for me to make use of my little blue bag. This was the southern most point we were going to be on the globe and had sailed a distance of 8598 nautical miles to get there (I must look up how many land miles that is). Then the announcement came that the ship would be turning at Cape Horn and the movement of the ship would be worse, so everyone should be prepared to hang on to the rails and take care going up and down the staircases. Well that was it for me and I had to go back to the cabin to lie down and not a moment too soon, as I made use of my sick bag immediately after taking my coat off. It was a while before we were back in calmer waters and although I made it up to the Bistro for some lunch I had to go back and lie down for a while. I was thankful for our big ship though; there was programme showing on the TV today called 'Around Cape Horn', a black and white documentary of one of the largest sailing ships known, and its 1929 sailing around Cape Horn. A fascinating programme with brilliant commentary added several years later by the sailor that filmed it. What they did, and how they did it, in those days, was unbelievable. I was feeling better by the evening and we went to the 'Wild, Wild West' Show with a celebration of country music - although there weren't many songs I recognised it was a good production and passengers who had been learning line dancing went up on stage to join the cast for the last song to show off their dancing. Another normal day at sea, just more eating, reading and sleeping.